Apple, Samsung, HTC... Whatever it is... IntelliARMOR has you covered! Hey there. How many of you guys own a "crackie?" What? You're not familiar with the term? Well, it's what I call a phone with a cracked touch screen. My brother and I coined that term years ago when I saw his iPhone screen all cracked. I remember him saying, "This is crackie. It's like my 3rd crackie." lol Man, I have yet to experience a crackie but my brother is not the only one that has had one. For whatever reason, the iPhones are prone to cracked screens. So why not reduce the chance of owning a crackie? And I don't mean by protecting you screen with a flimsy screen protector. Protect it with an awesome, crystal clear, exceptionally strong, oleophobic (that's water resistant) coating, and super easy to install. 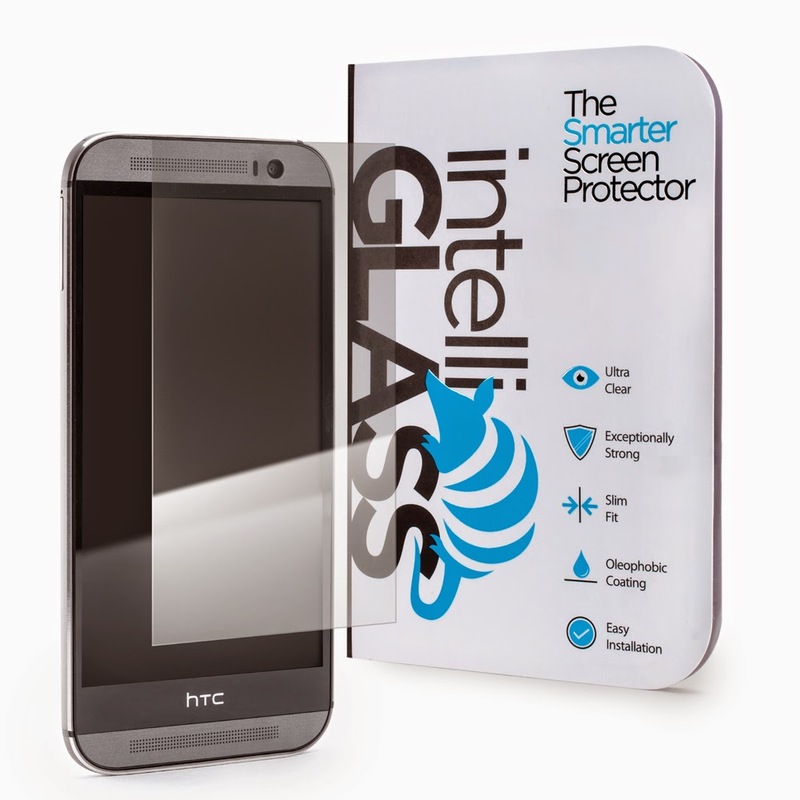 That's right, you need an IntelliGLASS Hardened Glass Screen Protector by IntelliARMOR! Our friends at IntelliARMOR provided me with an IntelliGLASS Screen Protector for the iPhone 5 to try out and review. AND... just because they are awesome, one lucky winner will be able to select a screen protector of their choice! They have protectors for iPhone's, Galaxy's, HTC, phones as well as protectors for tablets! Before we get to the giveaway, let me tell you about my experience. First off, let me tell you about the screen protector. This is one GREAT screen protector. Actually, it may be one of the best ones in the market. I've had a few screen protectors before and one of the biggest knocks on them is that they were thin and flimsy. It seemed like it was just a small sheet of plastic that would cover the screen. This IntelliGLASS Screen Protector felt like a strong piece of plastic. But it didn't feel like plastic at all. It's a weird combo of plastic and glass that gives it the strength of glass, but the flexibility of plastic. And to top it off, it's pretty slim. So you don't have this thick screen protector over your screen. Now, the screen protector claims to be water resistant so I wanted to give it a test. I held it under some running water to see just how water resistant the coating is. I was pleasantly surprised to see that the water beaded and slid right off the screen protector. Now, that's cool. No streaks, no soaking, no water marks. The screen protector exceptionally pass the water test. Also, I wanted to do a quick scratch test to make sure that the hardened part of the description is accurate. I grabbed my keys and had a go at the screen. I'm surprised to say that it did real well. After attempting to scratch the screen, I grabbed the cloth and wiped the screen. It was still pristine. WOW! Just wow! That right there had me sold immediately. This is definitely one hell of a screen protector!!! Oil resistant, smudge resistant, water resistant and scratch resistant! Now, on for installation. This was a cinch as well. The IntelliGLASS screen protector came with everything that you will need to make sure that you experience the easiest installation possible. Each IntelliGLASS comes with an alcohol pad, microfiber cloth, dirt clean film, and a screen protector. Before applying the screen protector, you need to make sure that it's free of smudges. The alcohol pad and cloth aid in this process. Once done, you make sure that there is no dirt on you phone or tablet's screen. Then, you simply peel off the film from the screen protector and apply to the tablet or phone. Bam! Really that easy. No air bubbles. No streaks. But most importantly... no more crackies! YOU CAN ENTER THIS GIVEAWAY FOR YOUR CHANCE TO WIN ONE! Giveaway is open to US and CAN residents only. Winner will receive a coupon code to order an IntelliGLASS screen protector (the PRO series are not eligible for this giveaway). Giveaway will run from now until March 28th. Winner will be announced shortly thereafter. Winner will have 48 hours respond to the winner's notification Email. Failure to respond will cause for forfeit of prize and new winner will be selected.